I told her I wanted to write about Big Carl. “Who the hell is Big Carl?” she said. She was unimpressed when I told her that Big Carl was and is a giant tuba. I couldn’t quite explain that sometimes people make things just to make them, and since the tuba is already quite an enormous instrument, making one that’s even bigger could be funny. “I think it was a publicity stunt,” I said, but to be honest I couldn’t really remember the article. All I could think about was the picture. 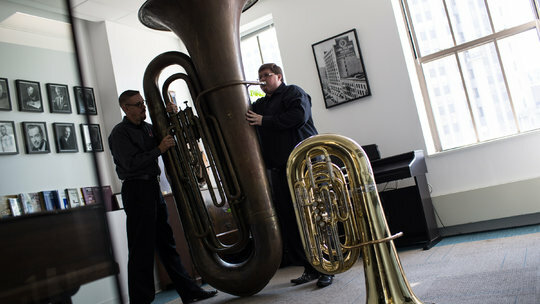 A giant tuba with a tiny man standing next to it, getting ready to blow into it. “I think I’ll need a third lung,” said the man who was going to try to play it. That was the last line of the article. The other thing I remember was that Big Carl is apparently NOT the world’s largest tuba. It’s like the 3rd biggest tuba and all these other giant tubas were made in Germany. Which for some reason makes complete sense to me. “Well then it’s a bugle for crying out loud,” she exclaimed. “It’s not a tuba at all!” She shook her head at me. “Well, then it’s a bugluba or a tubugle or a Butugle or a Tugba but it’s not a tuba! At this point we just started laughing. But back to Big Carl. Whatever it is, isn’t it great that such a silly thing exists? I hope it comes out of the store room and the man with the third lung plays it, and I hope the other German giant tubas come to the United states, and that they are displayed someplace prominent like Lincoln Square, Union Square or Times Square (the rectangle being a nice complement to the circular strangeness of the tuba), and that on New Year’s Eve, they all simultaneously BLOW. Oh, and there’s also some connection between Big Carl and John Phillip Sousa. Which also somehow makes sense. You can find out more about Big Carl here.